Warmill has another new piece of terrain available: The FoodBooth 9000. I'm eatin' it! The new FoodBooth 9000 is finally available from Warmill, made from lasercut MDF with a choice of 4 franchise-themed acrylic detail packs, including Happy Noodle! and Southern Fried Watersnake. Perfect for any 28mm sci-fi skirmish game, with a detailed interior and removable roof for maximum playability. 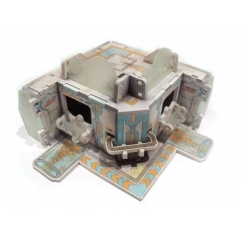 We also have a new range of warpgates perfect for use as battlefield objectives, modular Dragon's Teeth tank traps and Quick Deploy Barricades perfect for urban boards.